In addition to producing content for our lovely clients, we also publish material to help businesses like yours get more from their B2B content marketing efforts. We hope you find it useful. If you do, make sure to subscribe and we'll let you know as soon as we publish anything new. Today, more marketers than ever are being tasked with delivering tangible pipeline and revenue. But to do so, they are faced with getting to grips with new ways of planning and measuring success. In this new research, we look at how mid-market and enterprise B2B marketers are dealing with the challenge. From how the measure ROI to how they attribute success to the five key barriers holding them back. 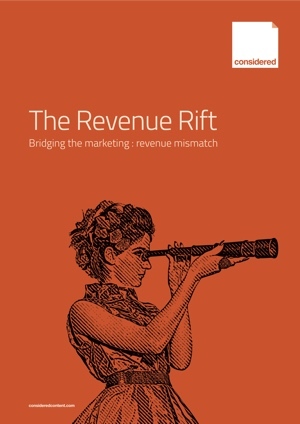 Are you ready to cross the Revenue Rift? The vast majority of B2B marketers use content. But far too few are seeing the results they need. Download this new guide to learn how to upgrade everything from lead generation and marketing automation through to lead nurturing, thought leadership and sales enablement. While the overwhelming majority of B2B marketers use content in some form, some see vastly better results than others from their content marketing. The cause? All too often it comes down to relatively simple mistakes in their approaches – mistakes fuelled by some common myths we see every day. In this ebook, we've brought together the seven myths we encounter most often.